Carleton Place - Real People. Real Stories. Real Stories Real People > Real Stories. Real People. Sam Bat moved to Carleton Place onto 110 Industrial Avenue in November, 2011. We cannot believe that we are already in our 6th year here and celebrating our 20th Anniversary! We are a small elite manufacturer of professional quality maple baseball bats competing with the best in the industry. Sam with his “SAM BAT” transformed baseball back in 1997. From his Ottawa garage he created the first professionally approved maple baseball bat and started “The Original Maple Bat Corporation.” From a now historic bar bet at the Mayflower Pub, Sam effectively changed an industry and now over 75% of professional baseball bats are made of maple. Sam started in his garage, moved to Rochester Street in Ottawa and then over to Gatineau. The facility in Gatineau proved to be too large, needed repairs and was not easy to access. The hunt was on and many of the outlying towns around Ottawa were evaluated. We looked long and hard for a good place to move the factory. 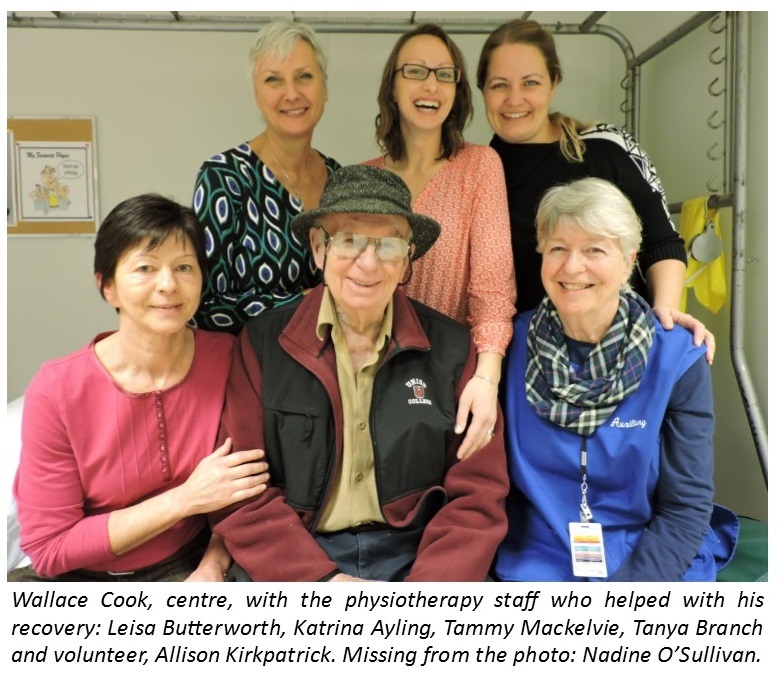 When we were considering the move to Carleton Place we were exceptionally pleased that the Industrial Park — where we now call home — is a mere 5 minutes from the Carleton Place & District Memorial Hospital (CPDMH). As a small manufacturer we take the health and safety of our staff very seriously. We utilize both hand lathes and high efficiency lathes, sanders and saws. Being able to respond to an accident and to be seen quickly so often makes the difference in one’s outcome. We haven’t had an accident in many years and are very thankful; however early-on with the business Paul, Sam’s brother-in-law, had an accident on the job in his garage and it is a constant reminder that life can change in an instant. Many of our staff have made use of the hospital over the past 6 years. The wait times have been good and the quality of care is always excellent. Having the hospital close to work has proven to be a great asset: staff with small children can have them seen without losing much time from work; the ability to recuperate close to home is far easier on family; and follow-up appointments close to home are much more convenient than having to travel long distances. This is why we support the CPDMH Foundation. We know that the Ministry of Health and Long Term Care does not fund patient care equipment and that new equipment is needed every year. We know that our company and staff contributions help make the difference between good health care and the exceptional care provided at the hospital because our donations go straight to where they are needed most. We sincerely hope that SAM BAT can assist by highlighting all that the hospital provides and by being part of Team CP! It is wonderful to be part of a welcoming and growing community. THANK YOU for joining us in making a gesture — big or small — to show that you care about having quality care here in our community and that you want the best equipment available to treat your family, fellow staff members or someone you love. To join SAM BAT in making a donation, click here! After time at the Ottawa Hospital Trauma unit following a serious car accident, I was relieved to learn that I would finally be coming home… to our hospital here in Carleton Place. Being back in my own community was the next best thing to being in my own home. I’ve always known that how a person feels mentally and emotionally has a huge impact on their ability to heal. I’ve now experienced that firsthand. I felt at home at CPDMH. I felt like a human being, not just a name on a patient roster. I felt visible and someone worth caring for. It meant a lot to be close to home – less travel time and stress for family and friends wanting to visit. I’ve spent times throughout my life appreciating our hospital here in the community. I have memories of being comforted as a seven year old having her tonsils out – terrified at the prospect of being in hospital and staying alone overnight. Many years later I was made to feel welcome by the nurses when I was there with my dying mom 24/7 in her room, wanting to continue caring for her even though she was no longer able to be at home. I have spent many a visit as a mom myself in the emergency room, seeking help and advice to sooth my kids’ ailments — ranging from high fevers to all manner of sports injuries. And now I have yet another experience to add to my gratitude list… support and care during my own physically and emotionally traumatic experience, including learning how to walk again. There are so many communities less fortunate than ours — that don’t have a local hospital close to home. Access to quality health care is a corner stone of a healthy community. It’s one of the many reasons people choose to live here or want to move here. I am eternally grateful to the team of dedicated, skilled and compassionate individuals who I was fortunate enough to have caring for me during my stay. I have a lifetime of reasons to be grateful for our hospital and the people who work at CPDMH… staff and volunteers alike. I'm embarrassed to admit that I didn't realize until recently that the Ministry of Health and Long Term Care does not fund the vital and necessary life-saving patient care equipment in our hospital and that instead we rely on donations. I am SO grateful to everyone who has helped the hospital buy this equipment that is critical to caring for patients — people like me or my family members or friends. Without these donations, our hospital couldn't function and I would not have been able to come back to my own community to heal… so THANK YOU for joining me in making a gesture — big or small -- to show that you care about having quality care here in our community… that you want the best equipment available to treat you or someone you love. To join Tracy in making a donation, click here! An unexpected heart attack found me in the emergency department at our local hospital one night this past year. Convinced I had pulled a muscle, but finding out I had had a heart attack, was both a surprise and frightening. There are no words to adequately voice my appreciation of the outstanding care I received at the Carleton Place and District Memorial Hospital, both in emergency and while being a patient. From the time I entered the hospital, the nursing and other hospital staff went out of their way to see that I was comfortable and well looked after. I can't praise highly enough the hospital staff who had to contend with someone who not only was having difficulty accepting his diagnosis, but I'm sure at times was reluctant to follow the protocol and treatment of someone who had just had a heart attack. Also, I want to say, the meals were excellent and ample. All in all, I have nothing but the highest praise for the care I was given, both in the emergency and after being admitted as a patient at our local hospital. 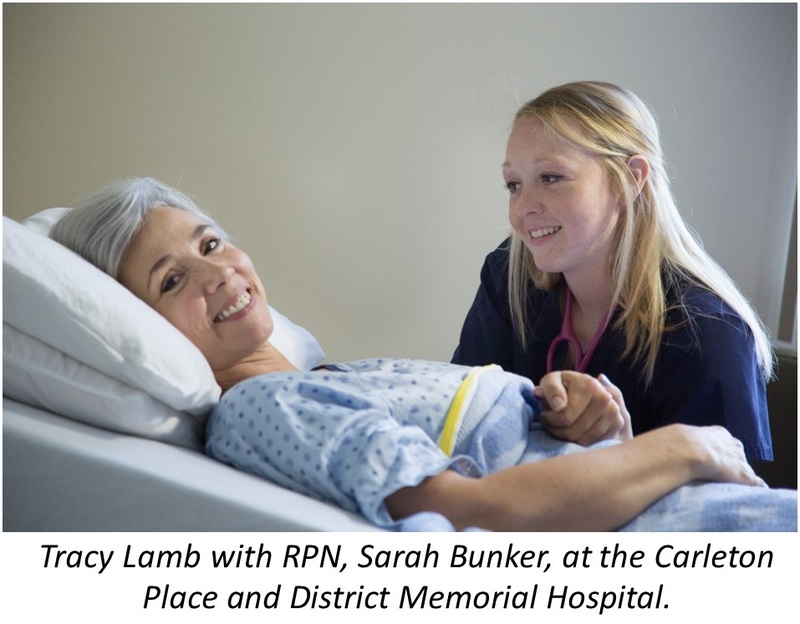 We, in this community, are very fortunate indeed to have the Carleton Place and District Memorial Hospital ready to serve us, and offering such outstanding care. And that is why I am a donor. I know that my contributions make the difference between good health care and the exceptional care I received because my dollars go straight towards where they are needed most: to the patient care equipment I used during my stay. It’s amazing that many people still don’t know this, but the Ministry of Health and Long Term Care does NOT fund patient care equipment used by patients at our hospital. If it were not for generous community members, like you, that also help to support the hospital Foundation, I would not have had the use of the machines that monitored my health and that diagnosed my heart attack. Every year, there is more vital patient care equipment needed at the Carleton Place and District Memorial Hospital. You can make the difference with a donation – you certainly did for me! To join Wally in making a donation, click here!